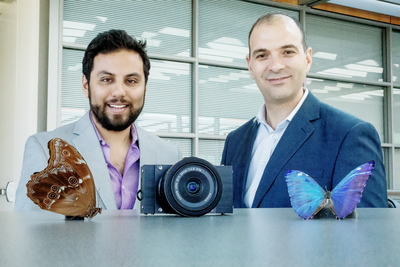 Inspired by the eye of the morpho butterfly, a new camera that can see both visible and infrared light could help surgeons more easily identify cancerous tissue. Images courtesy of Viktor Gruev. Video editing by Liz Touchstone. CHAMPAIGN, Ill. — Cancer lurking in tissue could be more easily found when looking through a butterfly’s eye. 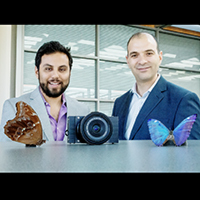 Researchers at the University of Illinois at Urbana-Champaign and Washington University in St. Louis have developed a surgical camera inspired by the eye of the morpho butterfly. The camera, connected to the goggles a surgeon wears, sees infrared signals given off by tumor-binding dyes so that the surgeon can remove all of the cancerous tissue. 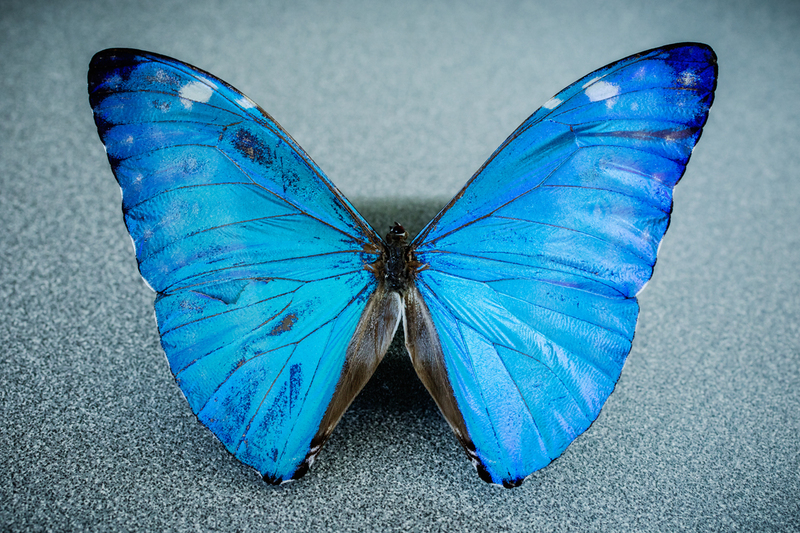 Nanostructures in the morpho butterfly’s wings create its distinct blue hue, and similar nanostructures in its eye allow it to see multispectral images. 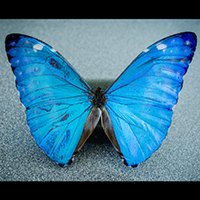 The morpho butterfly’s eye has specialized nanostructures that allow it to see multispectral images, including near-infrared. Gruev’s team built its camera with the same kinds of nanostructures, creating a small camera that can simultaneously register regular color images and near-infrared signals without needing to dim the room lights. Gruev’s group partnered with surgeons at Washington University to test the camera in mice and in humans. The camera was able to find breast-cancer tumors in mice, using a near-infrared fluorescent dye that binds specifically to the type of breast cancer the mice had. Since the camera can pick up signals beneath the surface of the tissue, the surgeons could even locate tumor sites through the skin. “We could image before the incision and identify the potential points of interest to minimize the incision,” Garcia said. They compared how well the physicians could identify the lymph nodes in a patient with breast cancer by looking for green color by eye, and then looking for the infrared signal using the butterfly’s-eye camera. See a video demonstrating what the surgeons see through the camera. The camera also found lymph nodes in two patients that the surgeons did not see visually – and the nodes turned out to be cancerous. “I would love to see green fluorescence to become the standard for lymph node mapping. It has a huge merit, compared with what’s currently being done to locate lymph nodes,” Gruev said. Next, the researchers are working to integrate their camera with endoscopic camera systems. They also have filed a for a patent on the butterfly’s-eye camera technology. Editor’s notes: To reach Viktor Gurev, email: vgruev@illinois.edu. The paper “A bio-inspired imager improves sensitivity for near-infrared fluorescence image-guided surgery” is available from the News Bureau.